Greetings my lazy friends, welcome to episode three of Jaime’s Lazy Late Night Cooking Corner, the show where I whip up last-minute single serve microwave treats every Thursday while wearing my robe. 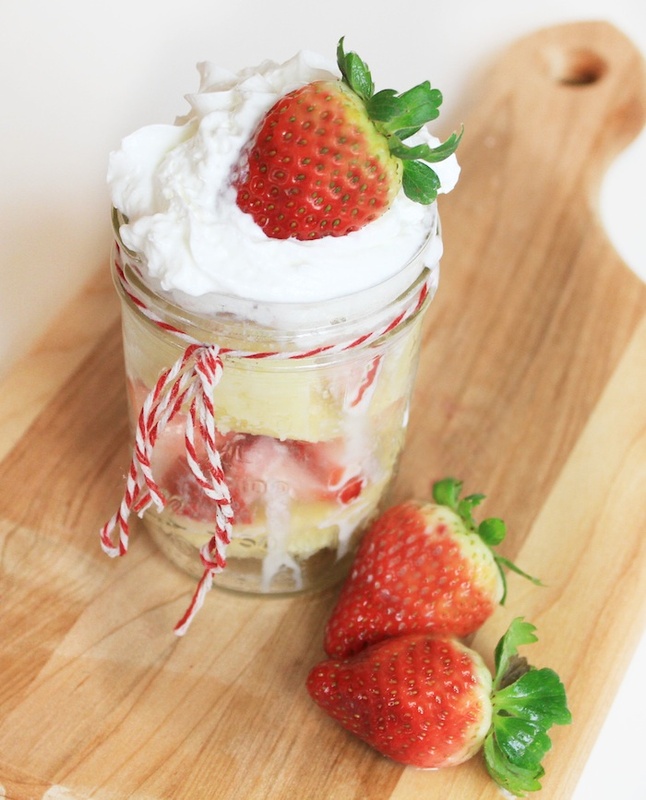 Today we will be throwing together an easy-peasy strawberry shortcake with a few ingredients you are sure to have in your pantry. This recipe is perfect for two, or if you are like me, one really big strawberry shortcake perfect for gobbling during one episode of The Mindy Project. Check out previous episodes for Single Serve Microwave Rice Krispy Treats and Microwave Blueberry Cobbler in a Cup, or try our famous recipes for One Minute Cup of Coffee Cake, Single Microwave Cookie in a Minute, or French Toast in A Cup. Combine all dry ingredients. Cut the butter into small cubes and add. Mush together with fingers to cut the butter until the mixture is crumbly. Mix together milk and egg. Add to dry ingredient. Microwave 2-3 minutes, checking every minute. Cut strawberries, pile on top. One of my favorite desserts in single serving size?? Yes! It’s posts like this that make me wish I still had a microwave! I just made this and loved it! Forgot to buy the crappy sponge cakes my husband likes so needed a quick solution. This was perfect. To get half an egg I put an egg in with 6 tbsp milk, beat lightly and then put half in the dry ingredients. I simply cooked the leftover egg/ milk like a half serving of scrambled eggs. Am definately trying this. That 1/2 egg solution makes so much sense, thanks. I nearly cried when I ate this, soooo good. I used less butter, and made the batter in a measuring cup then layered the strawberries in mug. I loved the cooked stawberry layers plus some fresh ones on top! In the video you say 2 Tbsp butter but the recipe says 1\4 cup. Which is it? 2 tablespoons makes more sense and looks like what is in the video. Someone needs to correct the printed recipe (4 T. equals 1/2 a stick — a lot of butter!). Just made this and Loved the ease of it as well as the taste and texture. This state is far to hot to turn an oven on most of the year.